First thing we can do to try and understand how we can solve this issue is to do a self join to see what’s the difference between the years in the records. What will also help us is getting how many unique years are in the table between the two years we are looking at, which we accomplish below using a subquery. Note that the CTE (Common Table Expression) that I am using already provides just distinct years per client. Using Client 0004, I’ve highlighted a couple of records. The first one in Row 16 where year1 = 2005 and year 2 = 2012 gives us a YEARDIFF of 7 (because 2012 minus 2005 is 7), and the number of records in between is 7 as well. 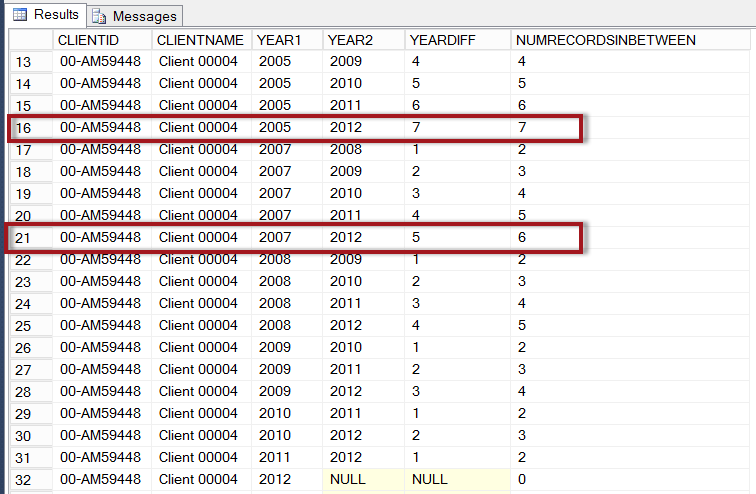 In reality, if we had records for this client for each year from 2005 to 2012, we should have 8 records not 7. This means we are looking for the record that has the highest NUMRECORDSINBETWEEN but also where NUMRECORDSINBETWEEN is higher than YEARDIFF. So, although Row 16 gives us a higher NUMRECORDSINBETWEEN, it is in fact Row 21 that gives us the maximum number of consecutive years. All the prep work is done. 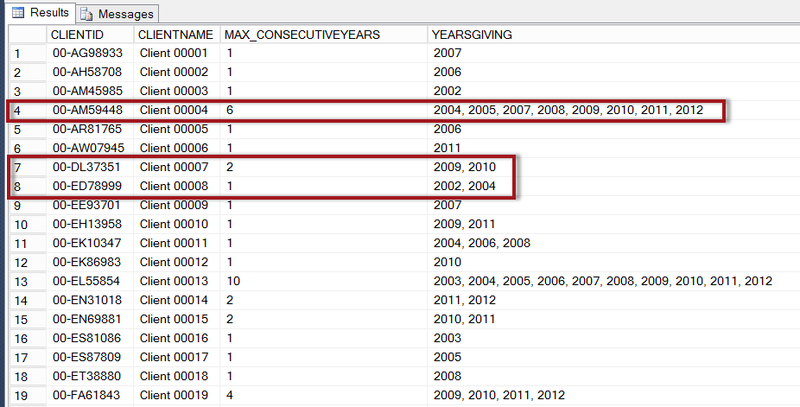 Now we can simply use the MAX() aggregate function to get the record with the most consecutive years. If you want, we can even throw in a subquery with FOR XML PATH to pull all the years, so we can visually check. (FOR XML is great at concatenating all these strings, but it’s not without it’s cons. Remember this is a subquery that will go through all your records, so please test before you use in your environments especially if you have large data sets). 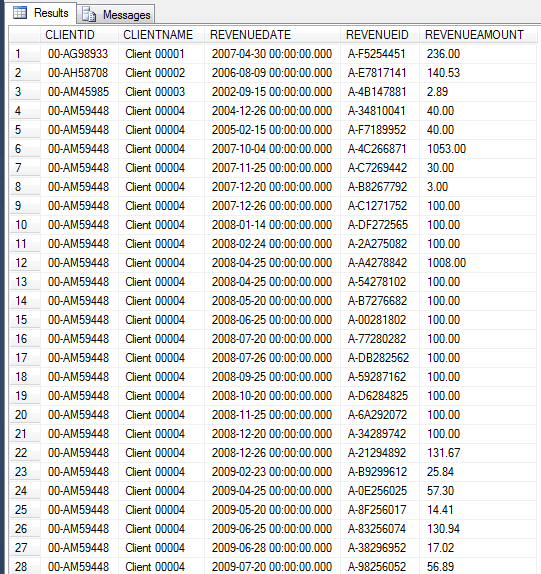 Client 00004 purchased from 2004-2005 which is 2 consecutive years, missed 2006, and then again from 2007-2012. Consecutive years is correctly counted from 2007-2012 which is 6. You can vary this solution a bit more, by utilizing ranking functions similar to Joe’s original solution. That’s it. 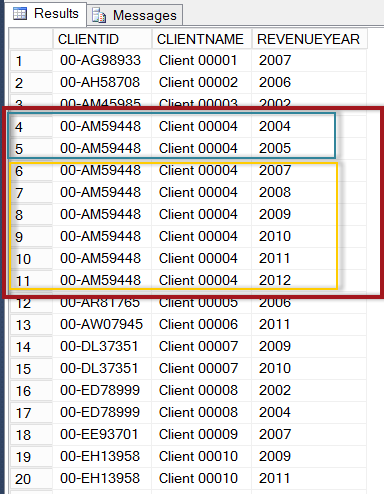 Hope this helped explain Joe’s elegant solution in StackOverflow regarding the thread Find the maximum consecutive years for each ID’s in a table (Oracle SQL) . Thanks Peter! It’s great to see other variations and improvements, I will definitely check your solution out. Stripping it down to the minimal data, how would this work for you? This is great. Very elegant. Thank you Joe! !